“As per advice from the Kenyan Embassy in Kuala Lumpur, if it’s a criminal case, then they will not provide a lawyer … it is not covered,” said Janet Cuarto, executive secretary of Consul Albert Yuchengco, quoting the conversation she had with the Kenyan Embassy in Malaysia. Asha Atieno Ogutu would have to rely on the local public attorney for her defense, said the executive secretary. Cuarto said the Kenyan Embassy would only help set up communication lines between Ogutu and her relatives in Kenya. 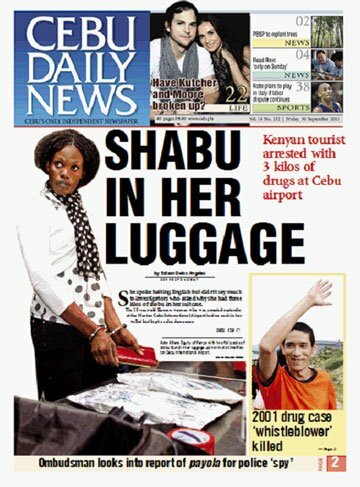 The Kenyan woman, 25, was arrested last week at the Mactan Cebu International Airport in Lapu-Lapu City after K-9 dogs detected shabu in her luggage. Two packs each weighing 1.5 kilos were found concealed in a false bottom of her checked-in suitcase. Upon arrest, authorities led by the National Bureau of Investigation in Central Visayas (NBI-7) also found out that she only had US $100 cash with her. Ogutu told them she was sent to Cebu for a weeklong all expenses-paid vacation by a friend who recruited her for a clothing business. During arraignment the other day at the Lapu-Lapu City Regional Trial Court, Ogutu sought a postponement saying she would wait for a lawyer from the Kenyan Embassy. But yesterday the Consulate office in Manila said this would not happen and Ogutu could hire a lawyer if her family in Kenya pays for one. Otherwise, she has to rely on the local public attorney provided by the Philippines. In similar drug mule cases involving Filipinos abroad particularly with the highly sensational cases in China, the Philippine government provided lawyers of its citizens. Cuatro said the consulate knew about the Sept. 29 arrest right after the incident. She said they are in touch with the embassy in Malaysia and that relatives of Ogutu were in touch with the embassy. It starts on a dirt road; traveling in a small van, bouncing in the back from side to side, as each push forward is interrupted by another deterring rut in the road. In a way, the road is almost too perfect a metaphor for the lives of the thousands living in the slum of Kibera, one of the largest in Kenya. Some may recognize it from the movie The Constant Gardener, but despite Hollywood’s attempt for a realistic portrayal of the slum, the true reality can only be seen firsthand, traveling on the dirt road, waiting anxiously for tomorrow’s unexpected gifts. For one Hopkins student, this account sounds all too familiar. In Jan. 2010, Sandhira Wijayaratne’s life took a turn the moment he stepped onto the plane to Africa. He wanted to help. So when the opportunity arose to travel to Kenya and develop a project of his own, he did not look back. Wijayaratne, currently a senior at Hopkins, double majoring in Public Health and Sociology, decided to study abroad in Kenya last Spring for four months with the School for International Training. “We did have some studying, and we did have projects, but for the most part our time was spent traveling and experiencing different things in the country,” Wijayaratne said. With the program, the students learned Swahili, attended house and community development seminars, as well as field of studies seminars, and designed their own field project. March finally came around, and most students had a good idea of what their projects would be. But for Wijayaratne, the search for his project was just beginning. Looking back, Wijayaratne recalls the nerves of those last days, and the helplessness he felt without a definite project in the works. As the clock ticked down, Wijayaratne rushed to develop a worthwhile project. “Initially, I was trying to work in a refugee camp. That took a bunch of paper work and time. We had to develop backup plans in case we didn’t get the camp,” Wijayaratne said. When Wijayaratne did not get the refugee camp project, he started to panic. But his luck changed the day he stepped on the plane and sat beside the woman who would become his saving call. “I talked to someone I met on the plane, and she put me in contact with one of her friends who ran an orphanage in Kenya for children affected by the HIV/AIDS epidemic called Angels of Hope,” he recalled. Wijayaratne found himself in Angels of Hope the last month of his stay in Kenya. He worked closely with Regynnah Awino, the headmaster and ounder of the orphanage. An angel herself, Awino started this organization when she was only 23 years old, initially taking in 40 children who either had HIV or AIDS or had relatives who were infected or died from the disease. After working with her, Wijayaratne saw the love that Amino gave to each student and the amount of care she invested into her orphanage. But even with this love came a price. “Amino provides free early education classes, one free meal program and social counseling for families, but she is raising the cost through her own pocket,” Wijayaratne said. Once Wijayaratne arrived at the orphanage, there were still several problems. The students were on vacation, and classes were not in session. He had originally thought about teaching at the school, but that option was quickly ruled out. Instead, Wijayaratne started to think practically. How could he take what he experienced and share those vibrant and touching moments with others? He knew that a picture said a thousand words. About a month after he returned, Wijayaratne started to compile the photos and interviews into a book. Flipping through the pages of his book “Faces of Angels,” one can experience the impact of a single photograph. Your eyes drift over the soft, dark faces of the children, their smiles locked behind their delicate mouths, their wide eyes smiling for them. It is through these pictures and stories that the reader is driven into a tunnel of truth and frightening imagery of the Kibera’s slum world. Wijayaratne can remember their eyes, their faces. Even after he took the photographs, the images of the children remained implanted in his mind and in his heart. “There were a couple kids that were my favorite. One was named Nicole,” he said. After some time, the kids befriended Wijayaratne. In fact, they couldn’t seem to get enough of him. “They would literally climb over each other to touch me and see my camera,” he said. These stories were reasons enough to configure a book. But Wijayaratne wanted to put his own touch on it. “I wanted to do a spinoff of poverty to benefit the people there. I like to think of it as how these kids are, I guess. They have real live futures, if we are willing to invest in them. They should be supported but shouldn’t be pitied,” he said, his voice steady and genuine. Wijayaratne made it a point to utilize photography for reasons other than simply aesthetics. “We all like looking at photos, but when westerners come, I feel like they take pictures for the hell of it,” he remarked. Wijayaratne is currently trying to fundraise for his book and raise awareness. He hopes to organize several exhibitions on campus to promote his book. But more importantly, Wijayaratne hopes to share his cause with the Hopkins community. “We need to put ourselves in place of others and open up world issues,” he said. It is difficult for Wijayaratne to put into words exactly how the trip impacted his life. He went to Africa in hopes of narrowing down what he wanted to do with his future. “Instead, it broadened my view,” he said, laughing a little. One of the questions that Wijayaratne raises in his book is: is it by choice or circumstance that we are born where we are? When asked about this, he refers back to himself. “I was born to a Sri Lankan immigrant. If my family decided to stay there, my life would have been drastically different,” he said. Perhaps what he says is true. But working with these children has provided Wijayaratne with a different kind of hope. He has seen this hope in the eyes of every child — as we can see it in his photographs — we can see it in the faces of angels. YouTube has announced the launch of a Kenyan domain, YouTube Kenya (http://www.youtube.co.ke) that will now offer some of the most informative and entertaining video content from around the world through a local interface that promotes the content most relevant to Kenyans. As proved by Julius Yego, javelin gold medalist at the 10th All Africa Games in Mozambique who perfected his technique by watching YouTube, there is something on YouTube for everyone. From amateur to professional content, the unexpected to the emotionally affecting, the educational to the entertaining, Kenyans now have greater flexibility to tell their stories, and find videos most useful to them. YouTube Kenya makes it easier for local users to find and view the videos most relevant to them, by tuning search and discovery algorithms such as featured videos and homepage, as well as category spotlights. Content uploaded by users in Kenya will show up as “browse pages” on the YouTube Kenya site, creating a new virtual space for the national community and giving Kenyan users the opportunity to increase their exposure. Speaking at a Nairobi hotel during the launch, Dr Bitange Ndemo, Permanent Secretary in the Ministry of Information and Communications said: “Information remains an invaluable resource that can be used by people young and old alike, professional and amateur to open up their worlds to new opportunities. “Accessing relevant information and sharing helpful stories on the Internet is enabling people to learn, train and partner with each other to help better their lives. The government remains committed to helping Kenyans connect with content that is most useful to them. ”] When he left Kenya for Texas, US in 1997, Hemmingway Saisi was upbeat that at last his childhood dream of pursuing studies to become a pilot had finally come true. But that was never to be. Soon after, he found himself entangled in complicated criminal cases ranging from a murder charge and allegations of making terrorist threats. He was first arrested and charged with the murder of an African-American man, an offence that was later on reduced to reckless manslaughter for which he was given a suspended sentence. Hemmingway did not like the outcome of his case. He felt that his lawyer did not perform to his as expectation-otherwise he could not have been convicted on the lesser charge of reckless manslaughter. He had expected a complete acquittal. He therefore launched a complaint to the American Bar Association(ABA), which is equivalent to the Law Society of Kenya. On his own account, Hemmingway claimed he informed his lawyer, Anthony Gualano, of his disappointment about Gualano’s performance at the murder trial, and that he made it clear to him he intended to file a complaint against him. Apparently stung by Hemmingway’s threats to expose him before ABA, the lawyer upstaged him and instead filed a counter claim of terrorist threats from Hemmingway. Soon, Hemmingway who had previously served several years in custody on the murder charges was rearrested and detained on the charges of making terrorist threats against the American lawyer. Hemmingway and his relatives both in Kenya and in New Jersey read malice on his latest troubles. They claim that Gualano made these serious allegations on him in order to pre-empt his intended claim on the lawyer at the association. In a Facebook posting, Hemmingway’s sister Jacqueline Kerubo Saisi claims that her brother was a victim of a witch-hunt. “Hemmingway Saisi has been imprisoned since May 8, 2008 on a charge that he made a threatening phone call to his former attorney, Anthony Gualano. Gualano had been retained in a case, which he did so badly that Hemmingway Saisi complained to bodies such as the bar association,” read part of the statement. For close to four and half years, the Kenyan student has been languishing in a New Jersey psychiatric detention centre where his relatives allege that he is being beaten up and forced to take psychiatric medicine. He is whiling away in foreign land at Ann Klein Forensic Centre, which treats clients with mental illnesses who are in judicial system. It is not clear how and why the authorities in New Jersey are forcing a purported patient to take psychiatric medicine because it is against federal Laws of America to compel anyone to take such medication, complains Kerubo. The family, through Kerubo, questions the rationale behind the New Jersey authorities purporting to spend over three years carrying out a psychiatric evaluation on her brother who at the time of his arrest was psychologically sound. She claims that her constant conversation with her brother convinces her that he is still mentally sound and that the treatment he is being forced to take is well calculated to cause him brain damage. In a conversation with The Standard from his captivity in New Jersey, Hemingway sounded coherent in his account of the pattern of events leading up to his current situation. He said he went to America in 1998 to pursue studies at a Texas university in aeronautic sciences (piloting) but his studies were disrupted when he was arrested and charged with the murder. His arrest stemmed from a domestic brawl that resulted into the death of an African American man. He said that after he arrived in America, he got married to an African American woman with whom he had a baby boy who is now eleven years old. After the birth of their son, he claimed that his wife started cheating on him. “I discovered that the lady was involved in an inappropriate relationship with her paternal cousin. This led to a confrontation that ended fatally,” he told The Standard in an interview. Hemmingway claimed that the man who was having an illicit love affair with his wife was a convicted drug runner and that he had just come out of prison when he came to attack him. “He galvanised the support of his gang members and attacked me while I was preparing to go to work,” he added. Hemmingway said the men beat him senseless. In the struggle, according to him, his attackers who were armed with swords accidentally injured each other and one of them was fatally wounded leading to his death. “When they attacked me, they were so vicious that it did not take long before they subdued me. However, I struggled to grab the sword that one of them was aiming at me. Unfortunately, the weapon aimed at me by the other attacker landed on his companion killing him. I sustained serious injuries including losing some of my fingers,” he narrated. Following the death of the man, Hemmingway was arrested and spent several years in custody awaiting the determination of his murder case. After three years, he was found guilty of a lesser charge of reckless manslaughter but his sentence was reduced to time served in custody and he walked out a free man. He then relocated to the State of Delaware. After his release, Hemingway allegedly raised questions about his lawyer’s conduct during the trial of his murder case, accusing the latter of failing him at the trial. “I spoke to him and expressed my disappointment that he did not do his job satisfactorily. The police officers informed him that he had made the threats on his former lawyer on phone. “I have asked them to provide the details but they have failed,” added Hemmingway. His family feels Hemmingway is a victim of malice and appealed to Kenyan authorities to demand that the US government ensures justice for him. Kerubo told The Standard she had quit her job in London to camp in New Jersey to fight for her brother’s justice. “My father died of stress related complications after he learnt of my brother’s tribulations in America,” said Kerubo in a telephone conversation. She said that she had expressed the family’s concern about the mistreatment of her brother, including the forcible administration of psychiatric medicines, but the authorities had not responded favourably. Hemmingway claimed he was being forced to take dangerous drugs that might destroy his state of mind, saying at times they use injection-guns to administer the medicine. 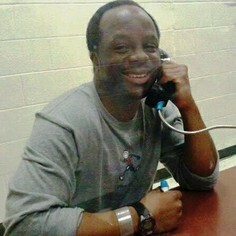 “I am undergoing a lot of torture here…sometimes I am forced to drink my urine,” he said on phone. “It is a conspiracy by the US authorities to destroy my brother’s memory in order to convict him by default,” his younger brother Wesley Saisi told The Standard in Kisii. Hemmingway’s family wants the US government to either charge him or deport him back home. “We have tried all avenues but we have not succeeded. My mother is depressed about the state of my brother,” lamented Wesley. Foreign Affairs Assistant minister Richard Onyonka said the Kenya Government was aware of the case. “We are following up the matter through our Embassy so that we can get to the bottom of it,” said Onyonka. The 18-member Kenyan delegation made its pitch to about 100 US executives at a forum in Washington sponsored by the Corporate Council on Africa. Many American businesses appear interested in establishing or expanding operations in Kenya, said Camille Richardson, the commercial counsellor at the US embassy in Nairobi. She travelled to Washington to moderate a panel that included Deo Oyango, CEO of General Electric-Kenya. “People are coming to the embassy every day looking to increase their footprint on the continent and who view Kenya as a regional hub or a jumping off point for South Sudan,” Ms Richardson said in an interview prior to the forum. Mugo Kibati, director of the Vision 2030 project, spoke to the gathering about the economic and political reforms that Kenya is undertaking. He also outlined forthcoming infrastructure initiatives such as a commuter rail system, and spoke about a plan to institute a stock exchange in Nairobi specifically for small- and medium-size enterprises. The forum took place at a time of acute concerns related to cross-border piracy and terrorism. But Mr Kibati said he doubted that investors will be deterred by the recent forays into Kenya by Somalia-based insurgents. The judicial proceedings in the Hague involving a few leading Kenyan politicians should also have no impact on investors’ decisions, Mr Kibati said. Tuesday’s event was intended as a two-way exchange that entailed potential opportunities for Kenyans to invest in the United States, Ms Richardson noted. University of Nairobi students on Wednesday evening vented their anger on motorists after lights went off on their halls of residence. In what they termed as “disturbance to our studies”, the students numbering about 50 claimed they were revising for end-of-semester exams when a blackout occurred in their lower State House hostels. They poured into the streets hurling stones at motorists. Traffic was disrupted on Nairobi’s State House and Mamlaka Roads as motorists tried to avoid the missiles. “This is very bad. We want the light back as fast as possible because we have a lot of reading to do,” shouted one of them as he hurled a stone in the general direction of the late evening traffic. It was not immediately clear what had caused the blackout but lights were restored after about an hour of darkness. The latest incident is the fourth time that the UoN students have taken to the streets this year. Previously, they rioted over mysterious killings of their colleagues. She won Sh500,000 from Enablis competition which she ploughed into her business by purchasing another machine. She won the World Wildlife Fund’s Nature Award where she took home Sh1.3 million. SEED Award saw her win Sh700,000 . She’ll be in Paris this October to receive the Cartier Women’s Initiative Award, which has a Sh1.2 million reward. Her annual turnover exceeds Sh1 million. Ms Rutto has been a millionaire many times at only 27 years of age. Mohammed Abbas, an undergraduate Business student at the University of Nairobi views 30 years of age as the ultimate psychological barrier. He has set himself serious targets he wishes to have achieved by then, failure to which he will consider his life a disappointment. “When I am 30, I expect to have made my first million, bought a dream car, be living in my own house and be a father of two,” he says. Mr Abbas, at only 21, has almost a decade before ‘judgement day.’ But even those inching closer to 30 years retain dreams of crossing the barrier, seen by many as the dividing line between youth and adulthood, with minimum targets met. Miriam Wekesa is already 28 -years-old, but she believes all her life’s biggest dreams will be met in the next two years before she hits 30. “I plan to be married and self-employed before I hit 30,” she says. The strange thing with Ms Wekesa’s wish is that with only such a short time remaining, she has no stable boyfriend and her “small salary” is not even enough to take care of all of her needs. But if 30 years is the limit of achieving success, one young woman has already achieved that — and she still has three years to spare. And already, she is causing waves in the world of green business. The road past the Kasarani Stadium in Nairobi is badly pot-holed and down the valley towards Baba Dogo is a sprawling slum. It is a grim site and hardly the area one would expect to find a story that is being held up as inspiration at home and even abroad. Lorna Rutto’s compound is hardly what many people would consider appealing either. Sacks of rubbish are stacked high above each other as about 15 employees of EcoPost Limited, Ms Rutto’s company, sift through the waste sorting different varieties of plastics into different containers. It is dirty work and we are handed gloves and protective gear as we are led to the main factory, where noisy machinery churning out new products make communication difficult. But while we squirm in the discomfort created by the noise and the pungent smell of burning plastic, our host carries on happily and clearly at ease with her environment. Ms Rutto is nothing you would call ordinary. In 2009, she was a relationship officer at Imperial Bank. But her burning desire to turn the plastics that dot most Kenyan neighbourhoods into useful products led her to quit the job. With her savings, she set out to do to what she knew would one day be her key to success. She bought an old machine from an industrialist who was closing down and started manufacturing plastic pellets from waste and selling them to businesses that make plastic products. “It was really hard at first. Having bought the machine at Sh400,000, I was really struggling to even pay rent which led to the premise’s closure on more than one occasion,” she says. But big ideas never die and Ms Rutto saw a business plan competition as her opportunity to get things right. “Enablis were advertising for people to send ideas and I thought that was something I was definitely going to win,” she says. She won Sh500,000 which she ploughed into her business by buying another machine. Today, her business is nothing to be sniffed upon. The machines alone are worth about Sh3 million. Apart from the 15 people she has employed permanently, EcoPost provides indirect employment to another 300. These are mostly street families who walk the streets and dumpsites looking for plastics. “Depending on the type of plastics they deliver, we pay them anything between Sh5 and Sh30 per kilogramme,” says Ms Rutto who expresses her deep satisfaction for providing an income stream for the most vulnerable people in the society. Because of her efforts to conserve the environment and create wealth for the poor, Ms Rutto is becoming an international celebrity having won many awards. She has won the World Wildlife Fund’s Nature Award at The Hague, Netherlands where she took home Sh1.3 million, SEED Award which saw her win Sh700,000 and will be in Paris this October to receive the Cartier Women’s Initiative Award which carries a Sh1.2 million reward. With those awards and her turnover exceeding Sh1 million a year, Ms Rutto has been a millionaire many times at only 27 years of age. But she is not satisfied. “We are still hiring a collection truck and that is still costing us a lot of money,” she says, adding that the government should do more to enable the development of the recycling industry. The benefits of what Ms Rutto is doing are massive from an environmental viewpoint. Since EcoPost commenced operations over a year ago, 600 metric tonnes of non-biodegradable waste rotting in the streets and polluting rivers, parks and neighbourhoods has been recycled to fencing posts and plastic pellets. According to Ms Rutto, every 25 posts that she makes from plastic waste saves a mature cedar tree. “We plead for support from policymakers to ensure our operations are enabled by the policy framework, not hindered,” she says. Her products, which are essentially posts for fencing, can nonetheless be customised to fit any clients needs. People are always coming in to demand all sorts of materials which she says, she gladly offers. In the next year, EcoPost plans on producing industrial size posts for street lighting, billboards and for electricity transmission. For her, impossible is a term that clearly does not exist. She urges people not to hold back when planning on going into self-employment. “Opportunities are everywhere and if I can make money from waste, there is money to be made everywhere. I have a great passion for what I am doing and for me, that is the absolute basic. When the passion is right, the will is there,” she says. And as the saying goes, where there is a will, there is a way. Very many people fail because of approaching life situations with a set mentality. I left a white collar job to deal with waste and I feel happier here, says Ms Rutto. Twin brothers in Nyamira County have been rescued from a lynch mob after they allegedly carjacked a Kisii University employee.The two were rounded up at Gekomoni village, West Mugirango constituency before they could allegedly strangle Jared Mabea and steal his car. A 5-year old school girl who was raped and brutally murdered on her way to school at Kanunga village, Kiambu County has been laid to rest. The school girls’ body was found dumped in a banana plantation. The girl had been adopted by a couple after her mother abandoned her in hospital the day she was delivered.